During the first big panel at Star Wars Celebration 2019 in Chicago today, we got a glimpse of the new teaser trailer and Episode IX's title for the upcoming film called "The Rise of Skywalker". The poster was then shown off in the middle of J.J. Abrams' panel with members of the cast. The final teaser poster from the Star Wars Skywalker Saga is similar to the previous advance posters from this third trilogy consisting of a black starry background, with the Star Wars text logo outlined in Rebel royal blue this time in the upper middle third of the poster. The initial teaser poster had a yellow outline on it and the middle film had a red outlined logo. 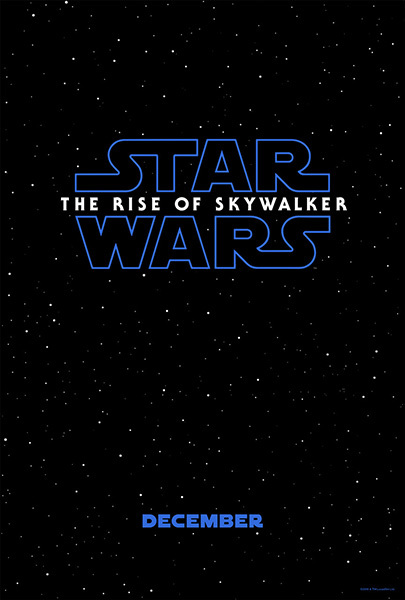 Amongst the logo in white lettering is the Episode IX's film title - "The Rise of Skywalker". At the bottom of the poster in blue lettering, it simply has "December" as the release date of the film. Also at the very bottom right in small blue text is the Lucasfilm copyright information.